Are Ferrari about to bounce back to the front of Formula 1? That is what the headline lap times from the first pre-season test suggested. All, though, is unlikely to be as it seems. Everyone looks at the list of fastest times of the day in testing. You can't help yourself. But they are essentially meaningless, as it is impossible to know the specification in which the cars were running - and there are so many variables, whether it be fuel load, tyres, engine mode or whatever. Anyone out there think Sauber will be on the second row of the grid at the Australian Grand Prix on 15 March? Thought not. Not even Sauber do. A far more effective way of analysing real pace in testing is to look at race-simulation runs - when teams fill up their cars and deliberately run a trial race distance. No-one did these in Jerez, not even world champions Mercedes, because it was too early for the new cars. But averaging out every team's laps over the four days irons out some of the discrepancies. Leaving aside the most obvious anomalies of Ferrari and McLaren, that looks a lot more sensible. All the teams know that "Mercedes are still the benchmark", as Red Bull team principal Christian Horner put it. The world champions hit the ground running on the first day of the test, when Rosberg completed an astonishing 157 laps - believed to be a world record for any day of F1 testing, let alone for the public debut of a new car. Mercedes were clearly not interested in setting headline lap times. There were no short runs of the sort that produced fastest times of the day for Ferrari and Sauber. Instead, aware that their only weakness in 2014 was reliability, it was about clocking up the miles with long runs. And, boy, did they do that. Despite problems on each of the last three days, Rosberg and Hamilton completed 516 laps - or 1,419 miles - over four days. In a brand new car with an engine that has been significantly developed over the winter. That is astonishing. No-one else even managed 400 laps. Mercedes might not have been the fastest overall - but they were not far off. And the consistency of their performance was remarkable. All this with the new engine running in a very conservative mode while the Mercedes teams gathered data. The other teams did not miss the message this sent out, whether it be the amount of running Mercedes achieved, or the way they conducted the test. "To turn up and do 157 laps on the first day is taking the mickey," Horner said. "What was more frightening is they were doing pit-stop training on the first day," McLaren racing director Eric Boullier said. "So their confidence level is very high. "They had such an advantage in 2014 I don't see them failing in 2015. The only thing we can expect is everybody is closing the gap." Ferrari - too fast to be real? It was Ferrari, not Mercedes, who produced the fastest laps of the test - with Sebastian Vettel and Raikkonen quickest on three of the four days. A note of caution, though. Raikkonen was also fastest on the first day in Jerez last year - before the team's worst season for more than two decades. And up and down the pit lane there was scepticism. As one leading engineer pointed out: "I don't know what Ferrari are up to - they're not going to be two seconds faster than Mercedes." This was the mystery of Ferrari's performance. The car appeared genuinely fast - but it was surely too fast to be real. The team's average lap time over the whole test was 1.5 seconds quicker than anyone else's. F1 history - and basic engineering logic - is clear. For one thing, a team as dominant as Mercedes were last year is never going to lose that edge this quickly; for another, a team in as much trouble as Ferrari were in 2014 is not going to dominate the year after. A clue to what might be going on was in Ferrari's run plan - where Mercedes were generally doing 30- or 40-odd laps at a time, rare was the run on which Ferrari did more than 10. The longer the run, the more fuel is needed to complete it (although a team can of course start a short run on a lot of fuel). And the more fuel in the car, the slower it goes. But while it would be a surprise to see the two Ferraris on the front row come Melbourne in six weeks' time, there are signs the team has made a genuine step forward. One of them came from Raikkonen. Not exactly known for his effusiveness, and notoriously sensitive to the way a car behaves, the Finn was much more positive about the new car than he needed to be at its first test. "This year is a completely different story to last year," said Raikkonen, who rarely felt comfortable in the 2014 Ferrari, and was annihilated by team-mate Fernando Alonso as a result. "I had a good feeling straightaway when I went out. We've improved in all areas. It's definitely a positive start." The other indicator is the progress the team have made on the engine - their biggest weakness last year, when it lacked overall power, driveability and performance from its hybrid system. Insiders say Ferrari have found at least 50bhp already since the end of last year and could have another 30bhp or so to add before the first race. This information was lent extra credence by Sauber driver Felipe Nasr. Now using a Ferrari engine, the Brazilian has experience of the 2014 Mercedes from a year as Williams reserve driver. He said the two engines "feel similar". Ferrari were reckoned to be about 40bhp down on Mercedes on peak power last year, and even if Mercedes add the 50-60bhp they were said to have for this season, this sort of improvement could put Ferrari, as one rival said, "right up with Mercedes" on engine performance. With an apparently better car, too, could Alonso's patience with Maranello have run out at just the wrong time? Having deserted Ferrari after five frustrating years, Alonso moved to McLaren, believing their new relationship with Honda would produce a car capable of taking him to the title first. But things have not got off to a particularly auspicious start. Alonso and team-mate Button completed only 79 laps over four days in Jerez. The first two days were hit by a series of recurring electrical issues and, even when these were fixed, other engine-related problems badly limited mileage. Still, 79 laps is not an altogether terrible total, given that McLaren had done just 12 after two days - and it is not that different from the experiences of many teams last year, when Honda's rivals were all trying to sort out their new turbo hybrid V6s. With such limited mileage, it is hard to come to any conclusions about McLaren-Honda's potential, especially given the contradictory signals. On the one hand, racing director Boullier said he was "confident the base was good", and added that the "driver comments were very, very positive". Equally, on the third day of the test, Alonso was lapping on intermediate tyres on a damp track at the same time as Rosberg's Mercedes. He was not losing much time, and at one point the timing screens showed a 'purple' time - for fastest of the day so far - in the first sector of the lap. The McLaren car itself is a thing of beauty, with a wonderfully tightly packaged rear end, and leaning heavily on the lessons learned at Red Bull by new chief engineer Peter Prodromou. On the negative side, though, the car was never remotely close to the pace in the dry. And when it finally got some dry running on the final day, Button was 16.6km/h slower through the speed trap than the next slowest car - and a whopping 30km/h off Felipe Massa's Williams, which was fastest. Rivals looked at that and concluded the Honda was way down on power. But sources close to McLaren said the car was running on 50% power for much of the day, and chairman Ron Dennis has already made it clear there will be new, more developed engines for the second test, and another iteration again for the final one. It will, as Boullier says, take some time before it is clear exactly how much work McLaren and Honda have to do. Red Bull had almost as disappointing a test as McLaren. They recorded the second lowest mileage after McLaren and were hamstrung by repeated problems with the Renault engine, which carried echoes of the troubled start to 2014 by the French manufacturer. But they will surely not be far away when it matters. The same looks to apply to Williams, third in 2014, who went about their work in the same quietly understated and impressive way they did in free practice sessions last year. Sauber - fresh from a dire 2014 - caught the eye with the fastest time on day three, and second fastest on the other three, apparently underlining the progress made by supplier Ferrari on their engine. And Lotus, having initially thought they might not even make the test at all, ended up running for two and a half days. The indications are that they, too, have made big steps forward after a disappointing year, as was expected, especially considering they have switched to Mercedes engines. 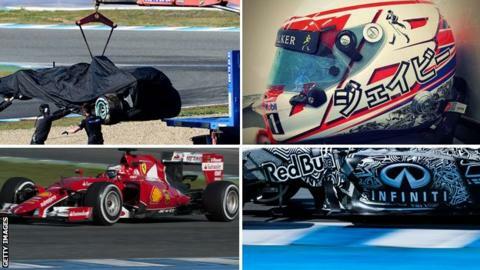 Which new F1 car is the loudest? "The whole package is better," driver Romain Grosjean said. "You could say that I am quite a happy driver." Predicting form at the first race from testing is always a very difficult business - and it is almost impossible after just one test as fractured as this was for many. Mercedes remain favourites, but it will take until at least the next test in Barcelona in two weeks' time to reach any conclusions beyond that. What are Red Bull trying to hide behind their dazzling livery? Read more on What are Red Bull trying to hide behind their dazzling livery? Gossip: Which legend's helmet does Button's new design resemble? Read more on Gossip: Which legend's helmet does Button's new design resemble?